Light dependent resistor or LDR is another component that you should learn about if you are new to electronics project design. This component has a resistance value which vary with the intensity of light that shines upon it. The typical value of LDR is greater than 1 Mega ohm if it is located in a dark environment. This value reduced to less than 1,000 ohm when light falls upon it. This component is made of Cadmium Sulphide or Cds and you can recognized it by the spiraling track on the top surface of the component. Test the functionality of this part by using a multimeter that measures the resistance of a component. First, place the component on a table and cover it with a non transparent paper. Measure the resistance. Do the same by shining a bright light onto its surface. A LDR mounted on a breadboard. 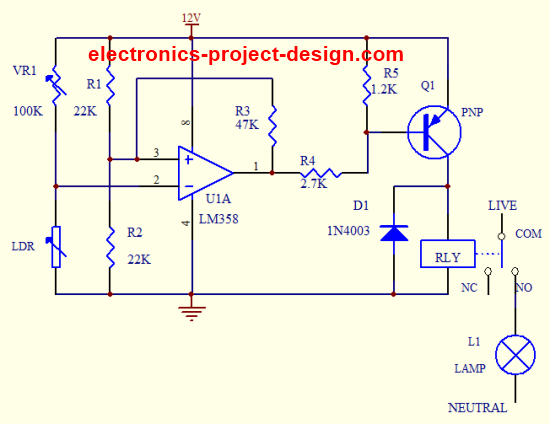 As shown in the circuit, the core component is operational amplifier LM358 and light dependent resistor. LM358 is configured with a hysteresis formed by it and the resistor R3 of 47K. This prevent the chattering of relay when the light intensity is unstable. 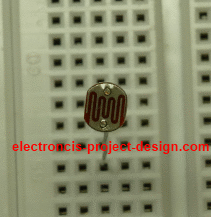 Two resistors R1 and R2 are used as potential divider that sets the reference voltage at positive input of the op-amp at 6V(when a 12V input is used). The negative input of the op-amp is formed by variable resistor VR1 and the LDR. When the LDR is in the dark, the resistance will be very much higher than the VR1 causing the negative input to be higher than the positive input of the op-amp. As a result, the output from LM358 will be LOW causing transistor Q1 to turn ON. The relay will also be ON. You can connect LIVE to the COM of the relay and a LAMP to the NO and Neutral to the end of the LAMP. This will cause the LAMP to turn ON in a dark environment. In a bright environment, the LDR will have a resistance of about 1K causing the input voltage at the negative terminal to be close to 0V. This caused the output of the op-amp to be HIGH resulting in the switching OFF of PNP transistor Q1. This in effect turn OFF the relay and the LAMP will switch OFF. One application of this circuit is to use it as a night light along the walkway. In this way, the light automatically lights up when night comes. Get your electronic components from our store. Join the electronics events to enhance your knowledge and network with other professionals in this industry. Learn how a 2W light switch is wired. Simple but fascinating. Check out here. Make your own printed circuit board and learn the processes involved along the way. More here. Learn how to dissipate heat from your heat-sensitive electronic components. Test the reliability of your products to the environment by stressing them in test lab. Explore the use of 7-Segment Display, 555 Timer, Decade Counter and Binary Adder. Get the circuit. Design and build a battery tester to test dry cell and rechargeable battery with a voltage of less than 2V. Check here. Construct this simple door bell chime and have fun. Find out more here. Build this simple home alarm to protect your house from intruders. See the schematic circuit.